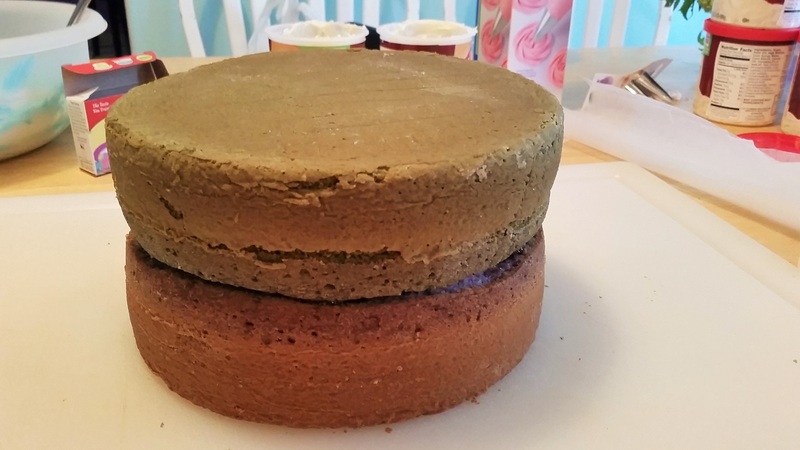 First thing that happened was we baked two cakes in a round 8 or 9 in pan, enough to give it two layers. 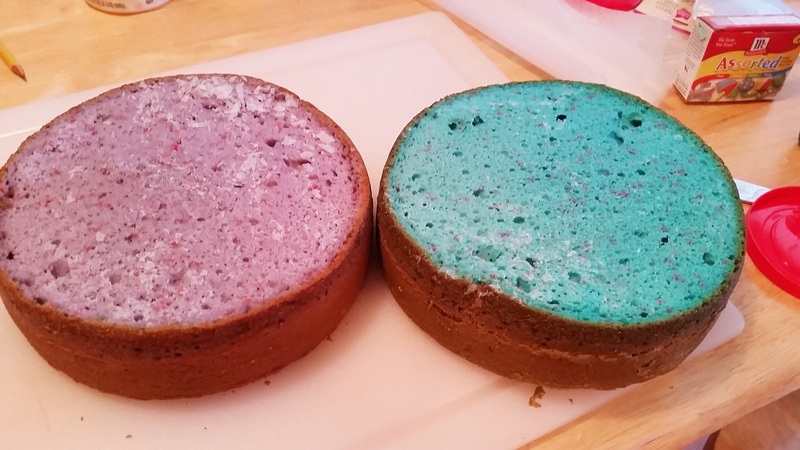 We added some blue and purple coloring to each pan to add to the mermaid color scheme. 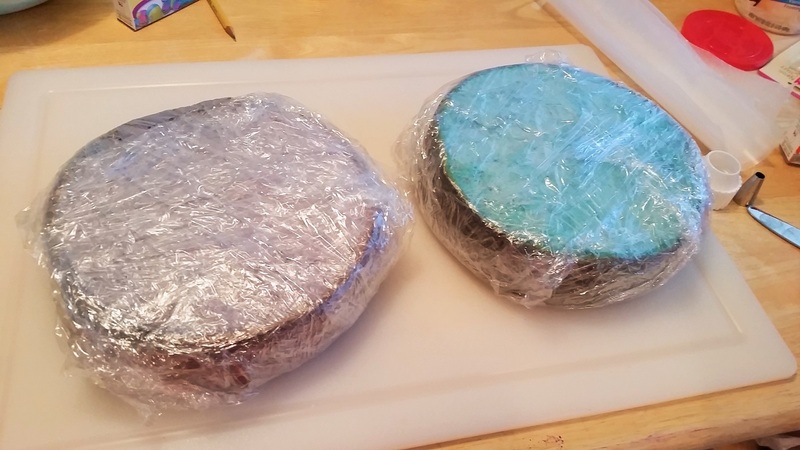 I often will freeze the cakes after being completely cooled and removed from the pan and wrap in plastic wrap. 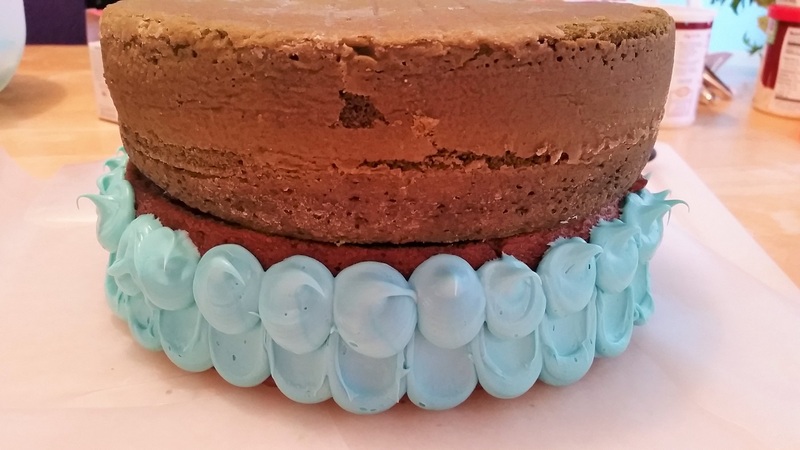 It's easier to work with cake when it is cool and frozen. 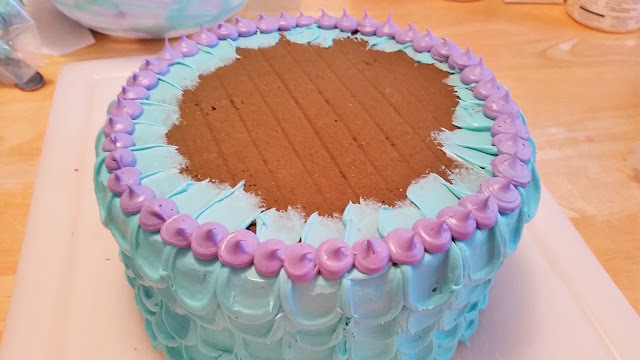 Unwrap the frozen cake and place on the board you want to serve it on. I tend to put some strips of wax paper under the four edges of the cake, to protect the serving board from getting frosting on it. 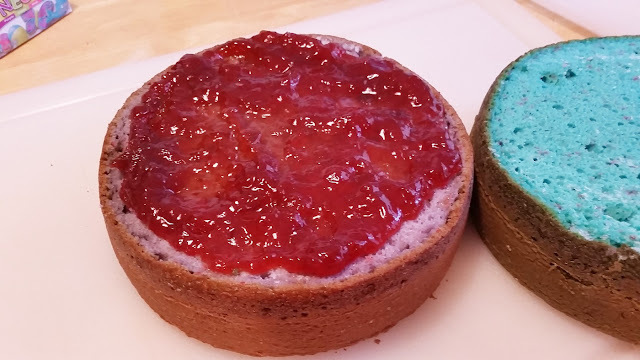 Add a layer of strawberry jam (or frosting) between the layers to help secure them together and stack the other half of the cake on top. Because they are frozen it is easy to trim back any areas that might be lopsided, or off center at this time. 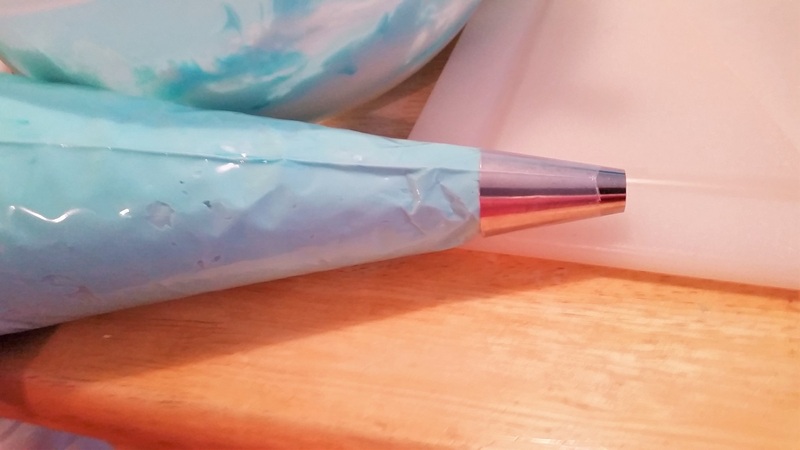 Now that the cakes are stacked you want to get a Wilton large round tip and put a large amount of light aqua blue frosting in a pipping bag. 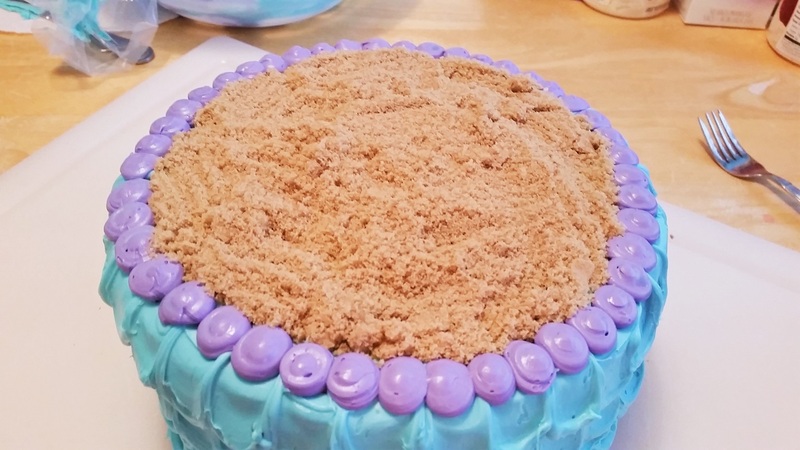 I have seen many cakes on pinterest that will put a line of dots vertically up the cake, then smooth half the dot over then add more dots. 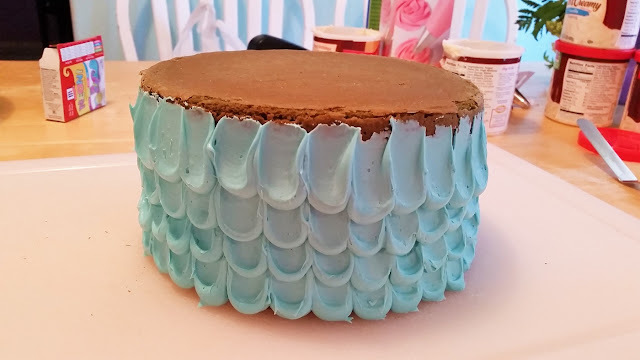 I wanted to do that same effect, only I wanted it to look like scales of a mermaid tail. 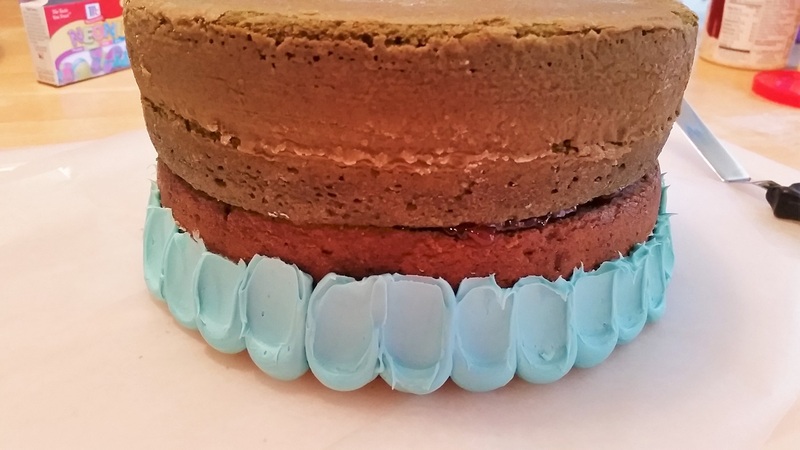 So I put a line of dots about an inch in diameter all around the very bottom of the cake. Then take a small round spatula knife and stick in near the middle of the dot, and press and pull up to streak the frosting in the area above it. 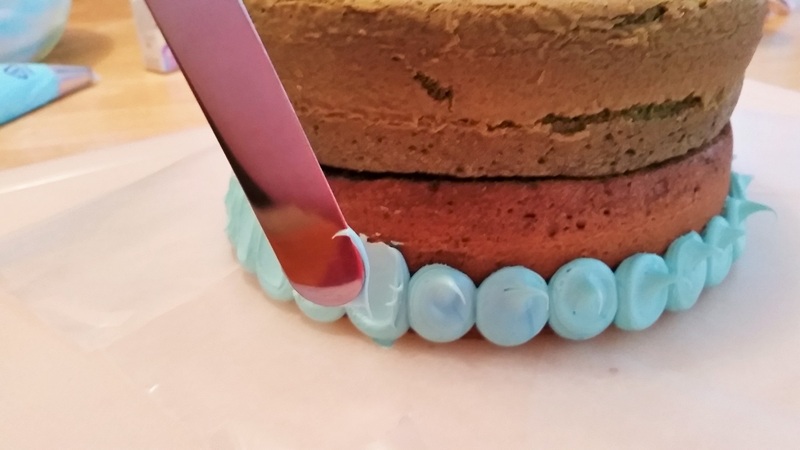 I ended up trading the one shown below for a smaller round tipped spatula (looks the same, just smaller) that would fit inside the blue dot. Do this all the way around until you come back to the first dot. Next layer you want to start up a little bit, covering up some of the streak from the first layer, and and a new layer of dots, and pulling them up as well. 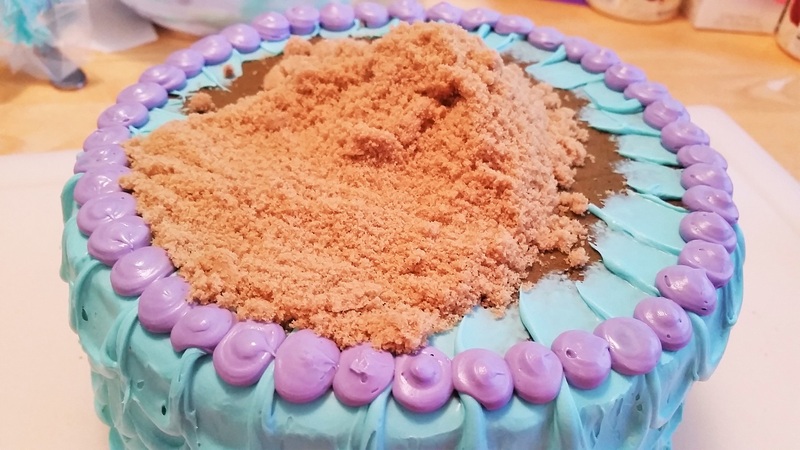 At the top layer I placed the dots as high up the sides without going over the top. 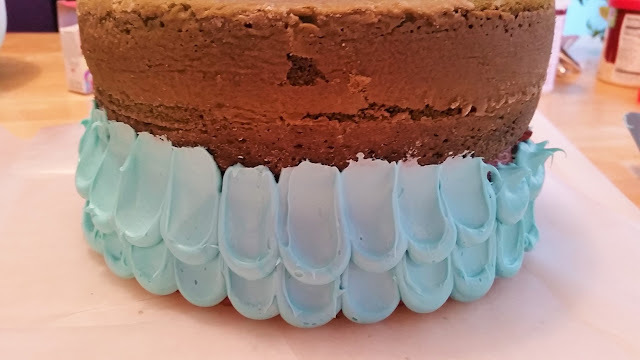 Once at the top, I pulled the streak up to the top side of the cake. Going all the way around, it will look unfinished, but we will cover that up. Next, switching color and frosting size tipped (smaller round tip) put a ring of purple dots around the top of the cake. 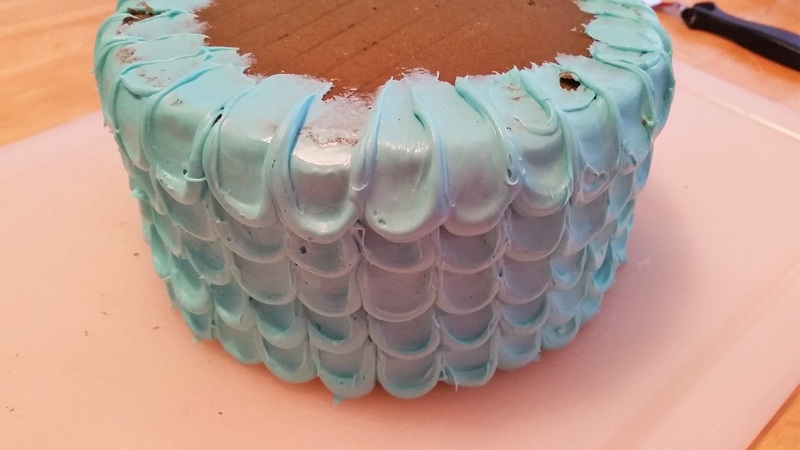 To remove the little peaks that stick up, dip your finger in water and touch the top of each dot. The moisture will push the tip in and make it look like a round ball. 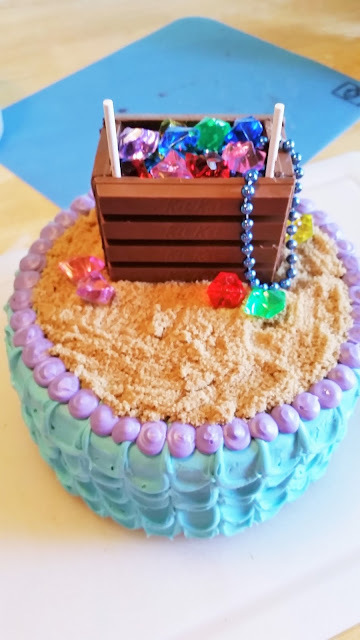 I wanted to make a treasure chest on the top of the mermaid cake, but I wanted to make it look like sand. So pour 1/2 cup (to start with) of brown sugar onto the center of the cake. 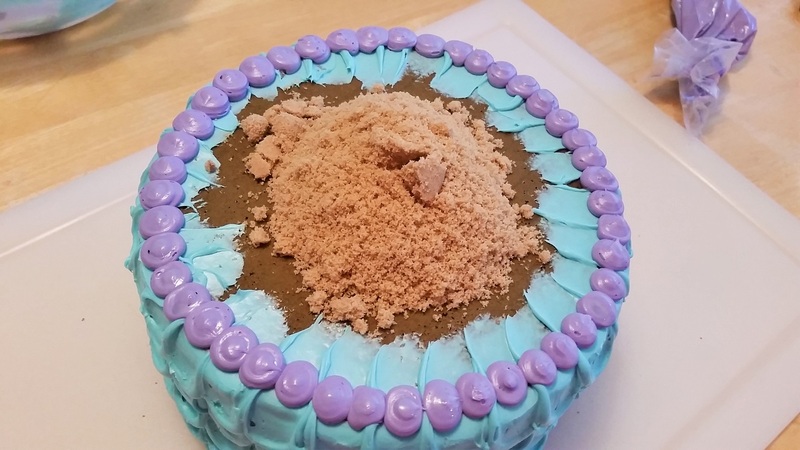 Be really careful and slowly with a fork pull the sugar towards the purple dot border. You don't want the sugar to actually touch or stick to the dots, or fall over the side of the cake, as it will stick to the mermaid scales. Go slow here until you have full "sand" coverage. After that, it is time to build the treasure chest made of chocolate. 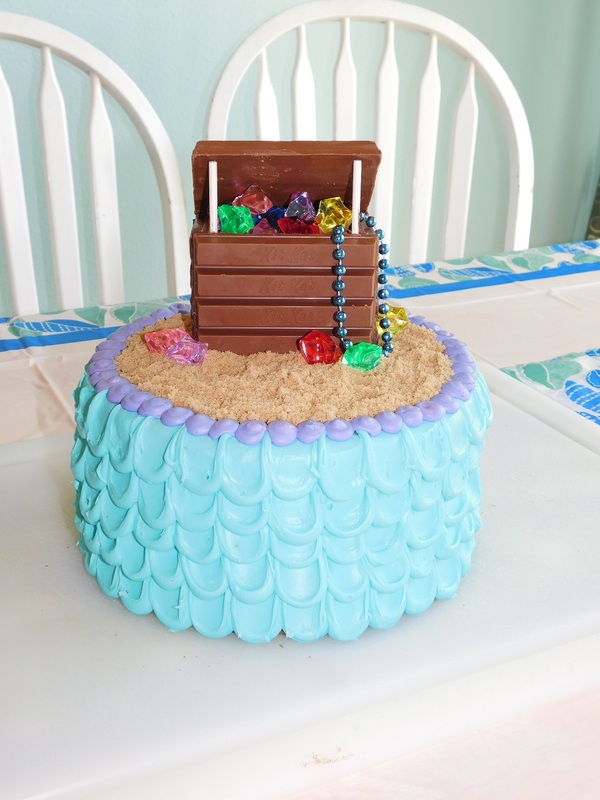 I mean, if you are going to have a treasure chest, one made of chocolate would be extra fabulous, no? 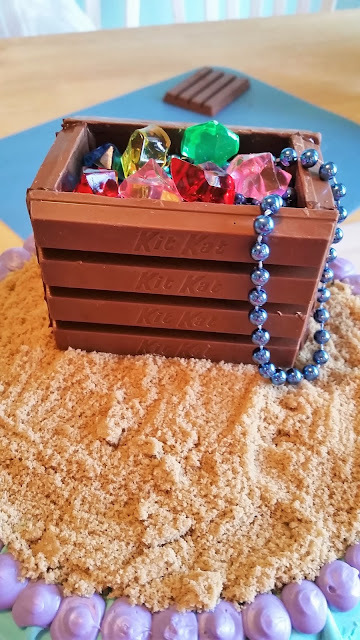 Gather up a pile of regular Kit Kat bars and make sure you are working in a cool place, or chill the candy in the fridge, as it tend to melt and I found even leave finger prints in the chocolate if it's too warm while you are doing this next part. 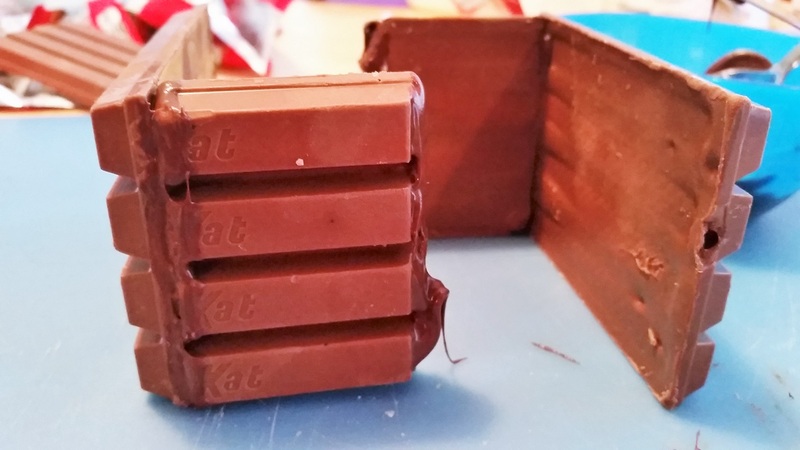 You will need two full Kit Kat bars for the box, plus one Kit Kat bar cut in half for the sides. 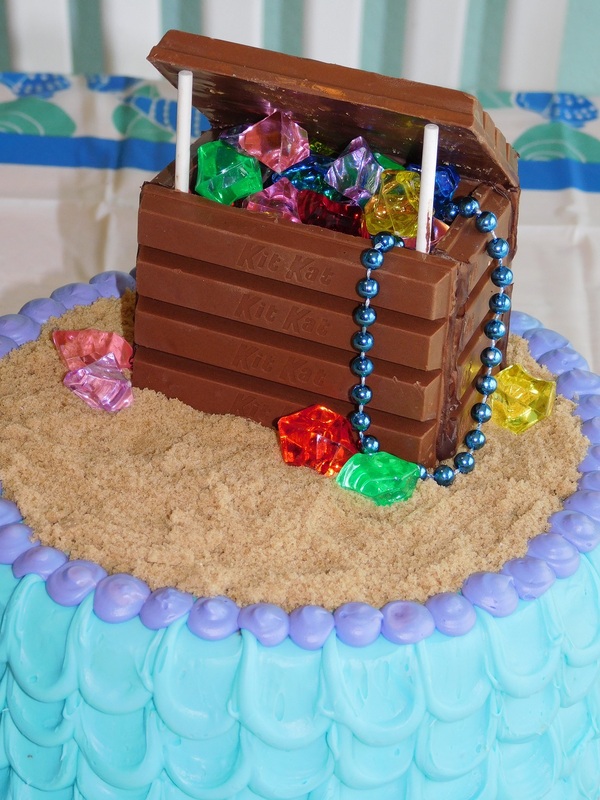 You will also need a full Kit Kat bar for the lid. 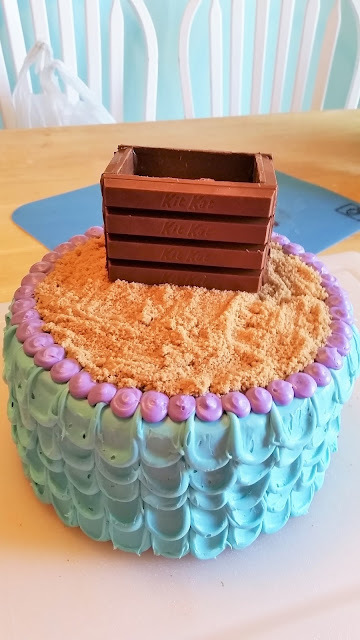 The bottom of this box is open and will sit in the "sand". I took a sharp knife an chopped off the very ends of the bars that flair out a bit, so it made more of a square edge. This was only on the parts that would not be seen. Melt a handful of chocolate chips in the microwave for 20 seconds at a time until you have liquid chocolate. 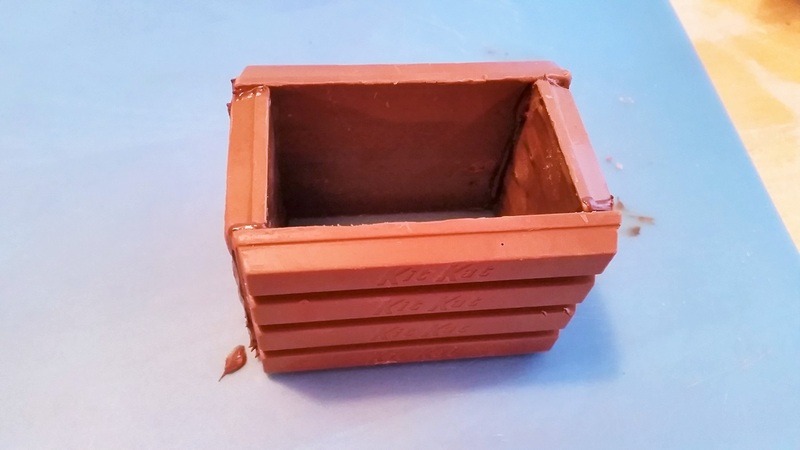 This will be the glue you need to make a chocolate treasure box Working quickly, paint a swab of liquid chocolate down one side, making sure the front of the words "kitKat" are right side up. Hold in place for a few seconds, then prop up against something so the chocolate can dry. Make a second version of this for the other side of the box, also prop to dry. 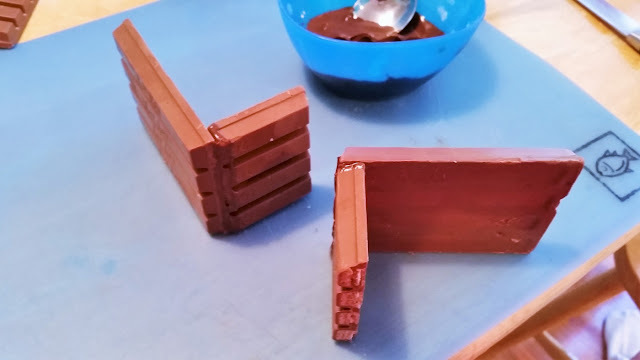 Once these two pieces are firm and holding together, place more liquid chocolate in the two corners and place all the pieces together to form a box. Again, let it dry completely. 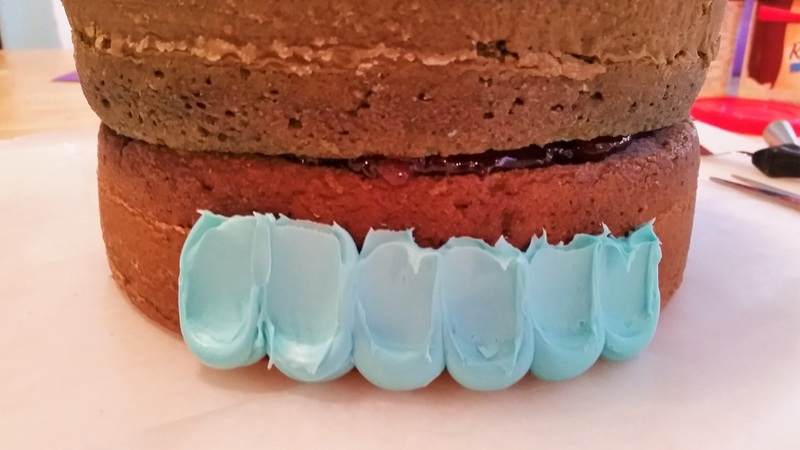 Now place the box on the cake where you want it. The "sand" will help hold it in place. 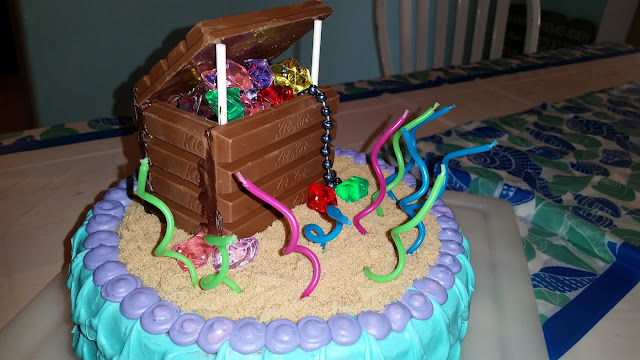 Next we need to fill it with "treasure". I decided to put some "filler" material in the bottom of the chest, so I used some captain crunch type cereal to fill up half of the chest, then I added those fancy jewels to the top. 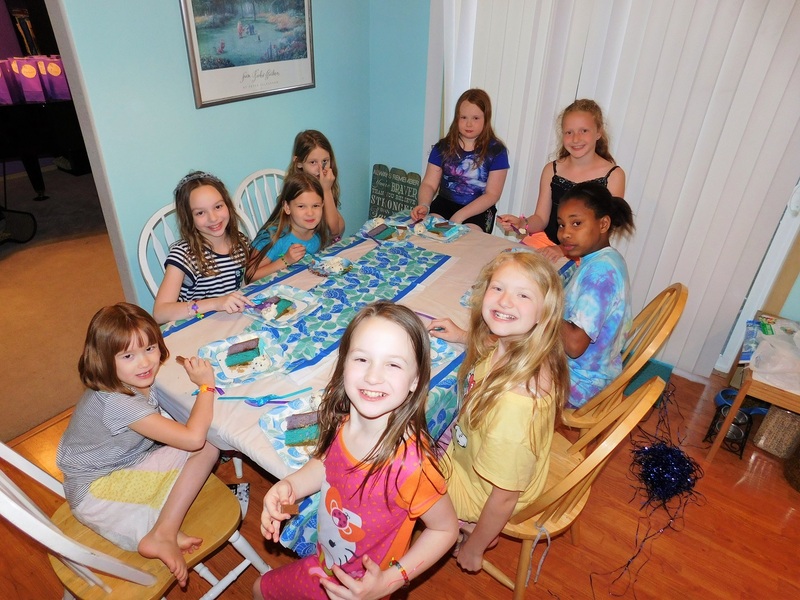 Jewels were found at Oriental Trading Company in a 12 pack of Velvet bags for vacation bible school, I just removed the jewels from the bag and used for my treasure. This was way more economical than buying other fake jewels from amazon or other places on line, and bonus, they looked pretty real! I also added a fake black pearl necklace hanging off the side of added effect. Next came the lid. I took two sucker sticks (can buy in a pack of 25 at the craft store) and stuck them in the front of the treasure chest in the two front corners. The lid of the chest consists of one full Kit Kat bar. Get some more of that liquid chocolate, and "glue" the lid in place, securing it at the back of the chest while holding it propped up on the sucker sticks. It will take about 30 seconds for the lid to set in place. 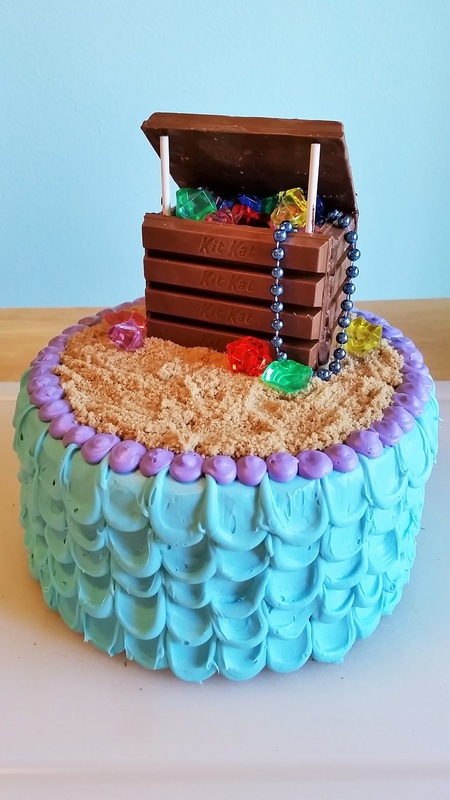 Chocolate treasure chest - B-E-A-Utiful! My middle child absolutely LOVED this cake. 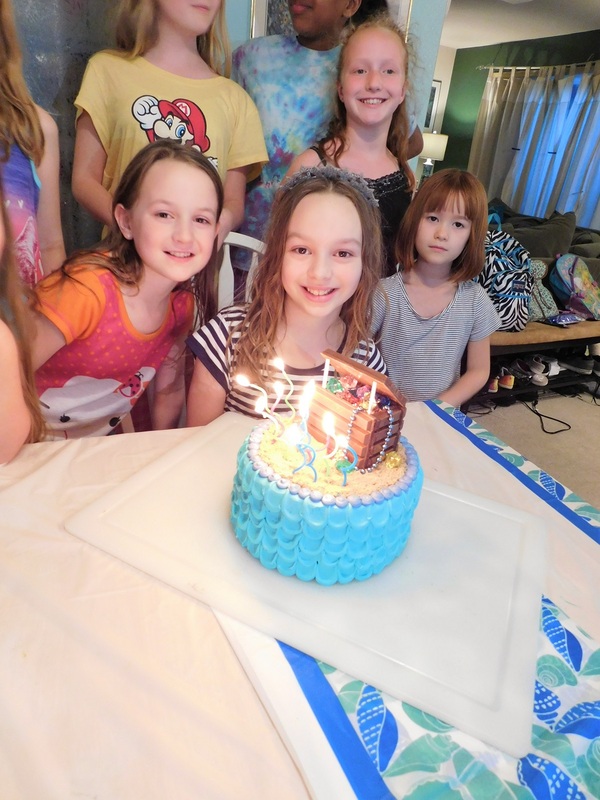 There were many OOs and Ahs when the party guests saw the cake. I found these cool twirly candles at Walmart that reminded us of waves, or seaweed. They looked really cool all lit up. 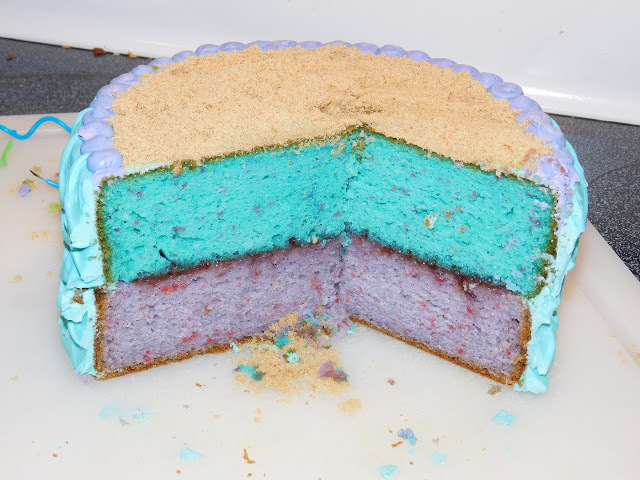 This was the inside of the cake, once we cut into it. 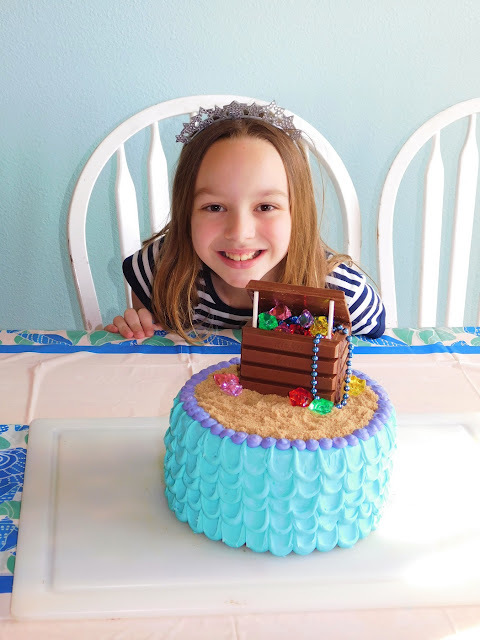 All in all, it fit right in with our under the sea mermaid party and the girls really loved his cake.